Product Description: Express elegant and attractive eye makeup with these gorgeous bronze eyeliners. 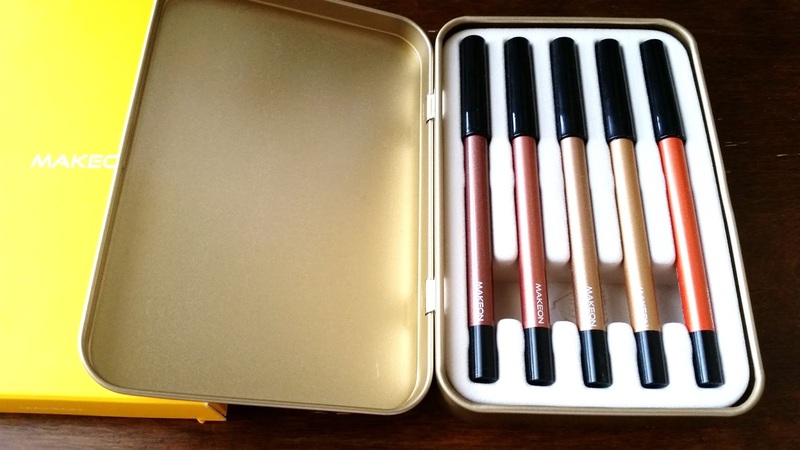 The set comes with 5 eyeliners and they are Dark Brown, Glam Brown, Deep Bronze, Blonde, and Sunshine. 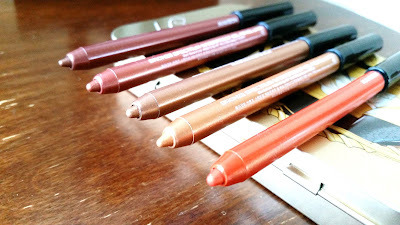 The eyeliners are easy to use and applies smoothly. They are waterproof and smudge proof as well. The Gel eyeliners can also double as eyeshadows, making them multi-use products. To Use: Apply the eyeliner how you would with other eyeliner pencils and extend the tail if you wish to. If needed, sharpen the gel pencils with a sharpener. When used as an eyeshadow, apply the eyeliner and smudge the liner immediately after with a finger or a brush. "Makeon Princess, who swims through rough waves in the ocean, has enchanting eyes! The secret of her beautiful eyes is ever more powerful waterproof gel pencil liner! If you have the Makeon Princess Gel liner, the magic of the Makeon Princess will never leave you on a rainy day, a snowy day, and even in the sweltering summer! 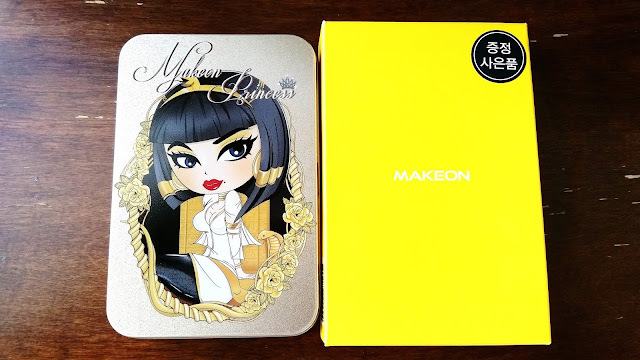 by Makeon Princess 'Limited Edition Season 3'." Yeah, the blurb might work for the first two princesses but not so much for Cleopatra who probably isn't braving through any rough waves in the ocean. It might be more fitting to say she's braving the dessert storms or something like that. Packaging: The box packaging is yellow and the words are white. I really wish they printed the words in a darker color because yellow is already bright so it makes the white words harder to see. Especially when some of the words are super tiny. The eyeliners come in a tin container with Cleopatra princess printed on the front and information about the gel liners on the back. When you open the tin container, you'll find the liners sitting nicely in their slots. 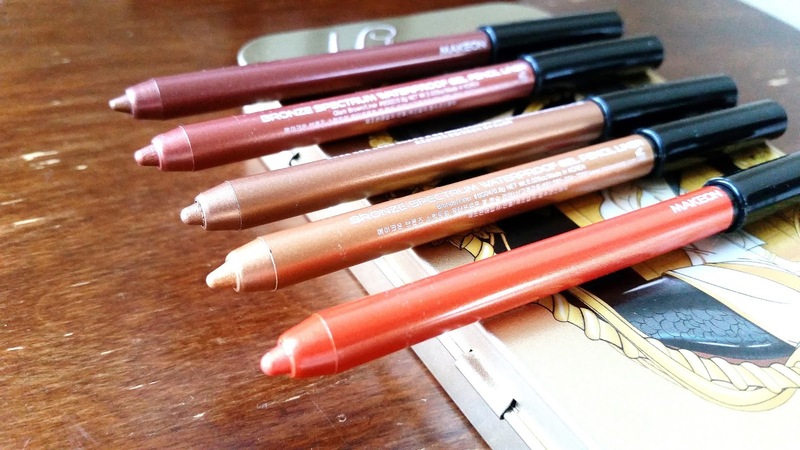 Color: The gel liners come in 5 colors which are Dark Brown, Glam Brown, Deep Bronze, Blonde, and Sunshine. The liner's individual plastic packaging also has the same color as the product, making them easier to differentiate. Texture: The gel liners feel smooth when applied and they remind me of my favorite Gelpresso liners. If you act quick, the liners can also be smudged a bit immediately after application to create a shadow or smudged smokey look. Michelle's Thoughts: When it comes to eyeliners, I always looks for 3 things. Are they waterproof, smudge proof, and sebum proof. 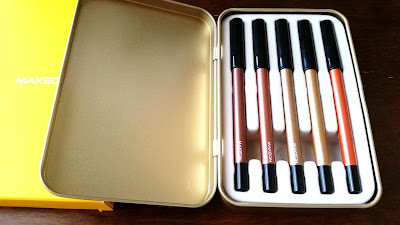 Sure the colors and formulas are just as important but if the liners aren't waterproof, smudge-proof and sebum-proof, then it can ruin the entire experience and make them unwearable. So when I got this set of gel liners, I put them to the test. The first thing was waterproof and these gel liners do promote themselves as being waterproof. Sure enough they are. The second part is smudge-proof. This is usually where some eyeliners show their weakness, however, these Makeon liners were pretty decent. Their smudge proof-ness is a bit less than my Clio Gelpresso Set. I'd say their smudge proof-ness is about 90%. The third part is sebum proof and I have to say they are almost on par with the Peripera Smoothie liner. However, the real test, as I've come to learn is whether the gel liners can be smudge proof and sebum proof at the same time and last over a duration of 8+ hours. So, I put all 5 liners to the test and the result? These liners ended up lasting me about 7-8 hours without budging much. There were bits of smudged liners here and there (I do have semi oily, hooded lids) but for the most part they stayed put. Not bad, I'd say. Out of the 5 colors, I already know which ones I would use the most and which ones I would hardly use. Sunshine, which is the orange color is probably the only color I wouldn't use much. It's a very bright orange color and I can't see myself using it often. Dark Brown is a color I see myself using very often. It's a natural brown color and can complement most looks. Glam brown is a red-bronze-ish brown color. I will use this color, but how often I'm still unsure. Deep Bronze is just as it says, a deep bronze color. It looks pretty and I really like it. Blond is like its name as well. I think the color is also beautiful and will use it often. Final Thoughts: Overall this is a great set of gel liners. I do wish they chose a color other than orange to add to the set, because this is one color I won't really use at all. The gel liners are only about 90% smudge-proof and sebum proof, which is why they lost a heart in the ratings. If they were over 95%, they would have gotten a higher rating and be reigning over my eyeliners alongside my Clio Gelpressos. However, 90% isn't too bad, it makes them on par with my Peripera Smoothie liner. 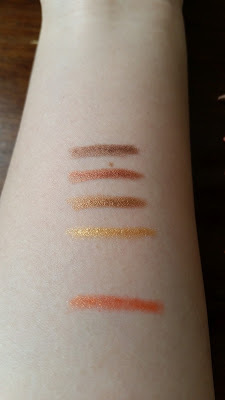 I do like the colors of 4 of the liners and will wear them often. Would I purchase it in the future? I might not purchase this exact set in the future but I do want to try other colors from Makeon. Do I think this Tosowoong Makeon Princess Limited Edition Season 3 eyeliner set is worth a try? If you think the colors are what you would use, then give it a shot. However, if you have semi-oily/oily lids like mine, beware it's only about 90% smudge/sebum proof.